1. Simply remove the head and place the candy into the hole. 3. 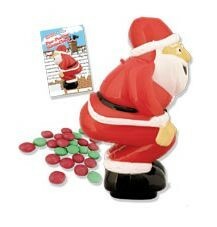 Shake the Santa gently to settle the sweets. 4. Gently hold down Santa around his body and push downwards. 5. Out come the tasty treats from his bottom! I guess the treats from Santa’s bottom are tasty because of all of the the milk and cookies the kids leave for him.